Since the very beginning, customers have been sending us photos of themselves wearing our utility kilts. 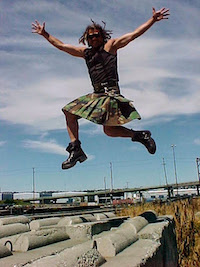 Rock climbing, hiking, in the mosh pit at concerts, at weddings, in pubs, riding motorcycles… almost every possible activity has been done while wearing our kilts, and someone has sent us a photograph of it. We quickly realized that the Utilikilts web site would be a great place to post these photos so other people could see them, too. So in December of 2000 - a mere 8 months after the first Utilikilt was sold - we named Hamish Bicknell of Storrington, West Sussex, UK - our first Photo Contest Winner. Every single day since then we have received more photos and stories from customers. In exchange, they wanted more from us! Interviews with the Utilikilts staff… photos of people at work… discounts… information on new models and fabrics… announcements of when we will be coming to their town… etc, etc, etc.